Members of COSSU receive the ChessStamp Review, our quarterly publication. They can take part in our auctions and Society Sales Service. Members are also able to place a three line advertisement in the Review. Annual Subscription rates are $17 (North America) and $24 (International). Special in 2010: all new subscribers will receive six different chess covers! If you are paying with Paypal, please add $2 to cover their fees. All sales go to the COSSU treasury. Anyone interested in a nearly complete run? (It’s missing one issue) Query the editor. 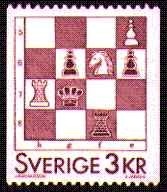 And Ray Alexis, before becoming editor of the Chesstamp Review, published this lovely number, which includes articles on chess stamps and other chess collectibles. Here's a rare opportunity to obtain a nearly complete run!